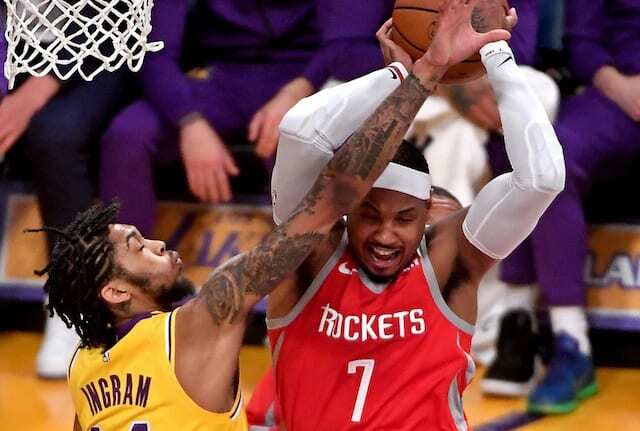 Is It Time For Lakers To Take A Chance On Carmelo Anthony? The Los Angeles Lakers are in a bad frame of mind right now. Once in fourth place in the Western Conference, they have fallen to the 10th spot in the past week, and if things do not turn around quickly, they could slide lower. Even the return of LeBron James after a five-plus week absence has not changed the Lakers’ fortunes. The team has dropped three of five games since he has been back. It would have been even worse if not for the buzzer-beater by Rajon Rondo against the Boston Celtics. The Lakers have finally reached the All-Star break just when it was needed most. There will be a lot of soul-searching in the next week as the team’s brain trust tries to figure out why things are going so badly and what, if anything, can be done to turn things around. One decision the Lakers will face in the next week is the likely addition of one more player. The team made a very surprising move at the trade deadline, parting with Ivica Zubac and Michael Beasley for a single player in return, Mike Muscala. This opened a roster spot which reportedly will be filled with a veteran who has been or will be bought out by his current team. The two players linked most prominently to the Lakers in recent weeks are Markieff Morris and Carmelo Anthony. There could be a surprise, but the consensus is that the front office will choose between these two options. Morris is the safe choice, although the Lakers may have competition to sign him. He is 29 and in his eighth NBA season. His best years were with the Phoenix Suns although he has played the past few years for the Washington Wizards and done reasonably well. Morris has been severely limited this season due to injuries, but he was recently cleared to return to action. Morris is used to playing 25 minutes and averaging 12 to 14 points a game and five or six rebounds. He is a solid if unspectacular NBA player. Most of the speculation, however, has focused on the prospect that the Lakers will sign Anthony, a one-time superstar whose game has fallen off a cliff the past two seasons. The reasons are unclear, but after a short stay in Oklahoma City and an even shorter stay in Houston, two teams with championship aspirations, one must assume things were bad if he was unwanted by both. Anthony only lasted 13 games this season with the Rockets and played in just 10 of those. He averaged 13 points a game and while his shooting statistics were not great, they weren’t that bad and it was a very small sample size. The Rockets got off to a much slower start than expected this season, and with the campaign barely underway, announced that they were parting ways with Anthony. Why would the Rockets so quickly abandon a player of Anthony’s stature after signing him in the offseason? No clear explanation was ever provided so one can only speculate. Anthony averaged 20 or more points a game for 16 consecutive seasons, the most recent of which was only two years ago. His three-point shooting was nearly 36 percent for the Thunder last season, which is good. Yet, he has been essentially homeless since the first month of the season. At this point, Anthony must know he is no longer going to start for any NBA team. He must also know that if he gets one more shot, he needs to give it everything he has left as it is his last chance. One would think he would jump at the chance to play for the Lakers, since LeBron James is one of his closest friends and L.A. is such a glamour franchise. The question is, with Anthony being such a high risk/high reward prospect as a late-season addition, is it worth the risk that things could go terribly wrong and become yet another distraction which the team can ill afford? If the Lakers sign Anthony, the only thing for certain is that the media will jump all over the story and the result will be a non-stop circus that could last the rest of the season. Since James was injured on Christmas, the Lakers have been in a steep decline and is at risk of not making the playoffs. Morris, or a player like him, could make a modest contribution as he is a solid veteran. But he will not be a difference-maker. 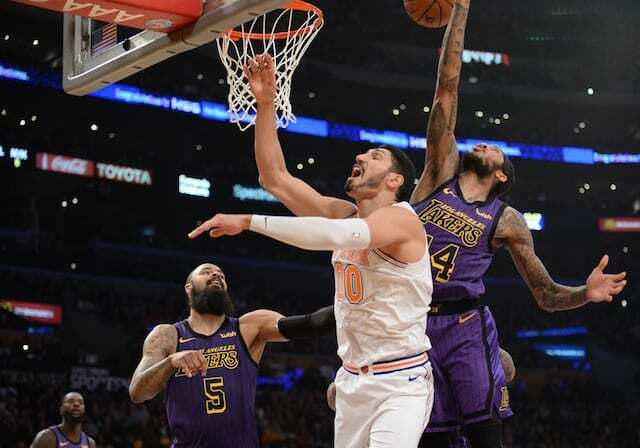 Anthony, on the other hand, could fail miserably with the Lakers, but there is at least a small chance that he can channel his remaining talent one more time and be a difference-maker down the stretch and in the playoffs. Of course, before they even consider signing him, the Lakers need to get a clear understanding of what happened in Houston. If it was just a matter that he wanted to start and would not accept a backup role, that is a problem that can be overcome if Anthony is now willing to come off the bench. If, on the other hand, he literally has nothing left at age 34, it might not be worth the risk. If the Lakers are really going to make a major push to make the playoffs this year with only 25 games left, signing Anthony could be tempting. It might be the kind of bold move that is necessary to shake the team out of its doldrums. Or it could be a disaster and contribute to the end of the Lakers’ playoff hopes. It is up to the front office to make the right decision. Many pundits will publicly snicker at the thought of any team signing Anthony, especially the Lakers. But behind closed doors in El Segundo, it will be a more difficult decision than many people realize.